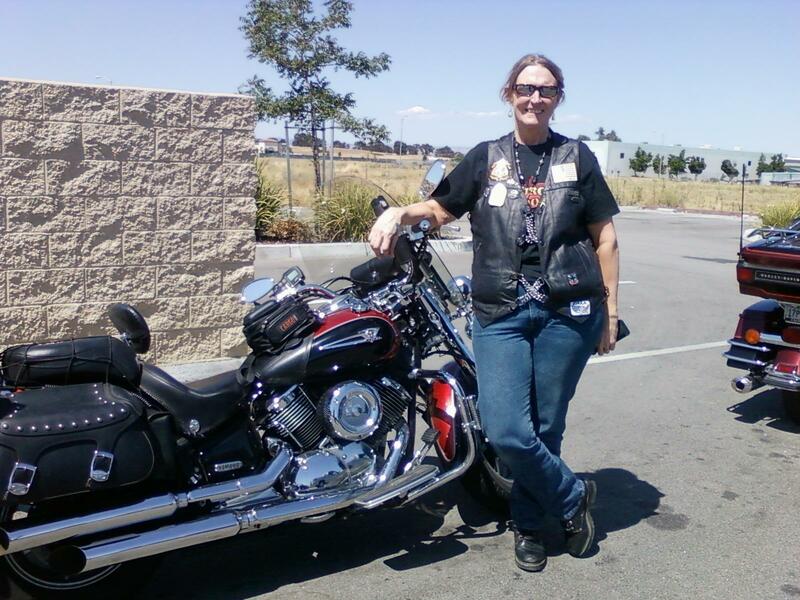 Profile of a Female Motorcyclist: Meet Annette | Helmet or Heels: I'm comfortable in either! Oh the things I’ve learned since starting these profiles! Like, you’re never too young or too old to learn to ride a motorcycle. Safety first means ATGATT (All The Gear All The Time). Women race and sling a wrench! Girly girls ride and so do tough gals. Being a female motorcyclist is like being in an awesomely wonderful club – it’s a soul-to-soul connection that is hard to put words around it! Ladies, you know what I’m laying down don’t you?! I stalked, I mean found, my next guest through her blog! Annette is from Selma, CA and writes Selmamcmama’s Blog, In the Wind: Memoirs of a Woman who Runs With The Wolves. 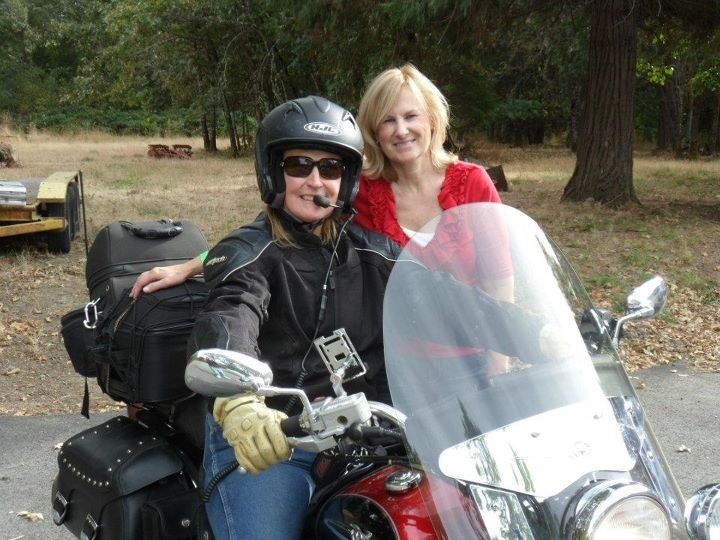 Annette has an encouraging story for anyone thinking about motorcycling, but especially for us more “mature” gals. How long have you been riding a motorcycle? I have been riding for 8 years. How did you learn to ride? At age 48 I decided to accomplish my dream; to ride a motorcycle. I bought my bike on E-Bay, without ever having sat on a bike. I had it shipped to CA from Atlanta, GA. I took the MSF course, barely passing. I met my husband, who offered to let me follow him around. We weren’t interested in a relationship. Notice that he is now my husband! He took me on roads no motorcycle should never go on. When I survived, he let me follow him to Sturgis, summer 2005. What was your first motorcycle? I bought a 2001 Honda Shadow ACE. I bought it from a woman in GA. It was listed on E-Bay. It was pretty; pearl and burgundy. That was how I chose my first bike. It has taken me to Sturgis twice, riding all the way, and I put 40,000 on it before getting my next bike. Every spring I intend to sell it, but can’t bring myself to part with it. How many have you owned? I have only owned two motorcycles. Why more, when I have fallen in love with both of my bikes. I’m thinking I might need a dirt bike though. Why did you want to ride a motorcycle? I saw a documentary on Sturgis. It featured a group riding cross country to get there. I was fascinated. This was 20 years ago, and a dream was born. My first husband told me “No, we are not going to get motorcycles”, so when I found myself single, I immediately looked on E-Bay. I wouldn’t recommend buying a bike on E-Bay unless you know something about them. Tell us about your riding. I ride for pleasure, as often as possible. I live in the Central Valley of CA so can ride year round. I ride to work several times a month, but my day needs to allow for casual helmet hair when I choose to ride. We always ride on our vacations, just returning from Northern CA for our anniversary. What advice do you have for women who ride or want to ride a motorcycle? DO IT!!!!! Take the MSF course. Ride with folks who know how to ride. Ride your own ride. What is the longest trip that you’ve taken on your cycle? 4,000 miles. Directly to Sturgis (1500 miles) and a circuitous route home. Do you belong to any motorcycle groups? I used to belong to groups on-line when I was learning and soaking up information. I ride with the Christian Motorcycle Association. Ministry while getting to ride; it doesn’t get any better than that. Do you have a favorite riding story? My favorite story is the one in which I met my husband. We met online, just to be riding friends (and he, my teacher). We went from Fresno to Coulterville, via Highway 41 and 49. He describes the ride up to Oakhurst as the slowest he’d ever been on (2005). By the time we got to Mariposa I was doing better. We stopped at an overlook, looking down to the Merced River. It has been described as our Tail of the Dragon. I hyperventilated, got anxious, but insisted I’d go wherever he led. I made it, but when we got to our destination in Coulterville, I saw another way to get back to Fresno. No such luck, he made me go back the same way. 50,000 miles later, we’re still riding together! What do you do when you’re not riding? I’m going to be Grandma for the first time in two weeks. Woo Hoo! I work in Mental Health. Between the two of us, we have 6 kids, so family time is very important, and then the times it’s just the two of us enjoying our patio, too precious for words. 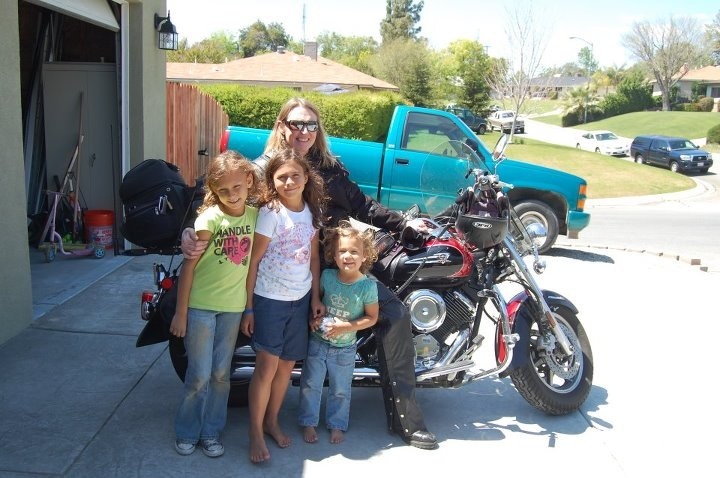 This entry was posted in Lady Riders and tagged ATGATT, Blogger, California, endorsement, Female Motorcyclist, first motorcycle, Honda, license, motorcycle, Motorcycle Safety Foundation, riding, women. Bookmark the permalink. Nice to meet you Annette. Pam – your link to Annette’s blog didn’t work. Annette our stories are similar in that I too learned to ride in my late 40’s and my hubby was patient because I drag behind him a little. Congrats on the grand baby!